I'll come right out and admit that my expectations were very low for EVERYBODY'S ROCKIN' (1983). 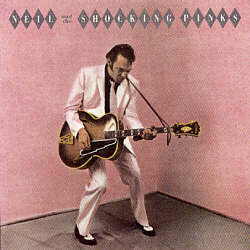 The album is credited to "Neil Young and the Shocking Pinks", and even a brief glance at the cover photo of Neil, done up all '50s-retro, clues one in to the fact that this is likely to be a "different" album. What a pleasant surprise! Before you think I'm totally hooked on the Neil kool-aid, let me preface by saying I would never recommend this as an introduction to Neil Young's music. However, if you have any interest at all in '50s music and the roots of rock 'n roll, and/or you are already a Neil fan, then this album can be a very fun listen. First off, these "Shocking Pinks" are no musical bozos. They include Ben Keith and Tim Drummond, both of the "Stray Gators", the band Neil assembled for HARVEST (1972) and its so-called "sequel", HARVEST MOON (1992). This is most definitely NOT a novelty album, although I'd imagine Neil had a blast making it. This is a salute to our R&B/early rock 'n roll roots. And, Neil sounds GOOD doing it, too. The song selection is a combination of Neil originals, and cover versions of some all-time classics. On "Payola Blues", Neil sings, "No matter/Where I go/I never hear my record/On the radio". This could easily be applied to TRANS (1982), or even as an easy prediction of the commercial failure of EVERYBODY'S ROCKIN' itself. Looking at Wikipedia's Neil Young entry, you can see this album described as "rockabilly". I think that's a bit narrow, depending on how detail-oriented you want to be about '50s sound. Hell, "Wonderin'" actually has "do wop" sung repeatedly in the backing vocals. However, on "Cry, Cry, Cry", Neil does sound like a reincarnation of Bill Haley, or perhaps even Buddy Holly. So, call it what you like. It's cool by me. Other haahnster notes: "Mystery Train" was most famously covered by Elvis Presley. Neil's version of "Bright Lights, Big City" is relatively true to the original, as opposed to the uptempo, edgier version recorded by Them (featuring Van Morrison) in 1965. Bottom line: As you can calculate from the times listed above, the whole thing is over in less than half an hour. I'm a busy guy, but I always have at least 30 minutes for Neil Young! And, quite frankly, I listened to the entire album 4 times in a row last night. It was that much fun.